I'm selling this deck! For every sale made through Inkbunny, I will donate a dollar ($1CAD) to this site. You'll have to tell me via email after you buy your deck so I can be true to my word. Tree of Life: The mystic on the path between Kether and Tipareth. Concept: The necessarily slow and steady progression along the journey of awareness in the upper planes of super-consciousness. Description: A black rabbit holds her arms outstretched to the sky, she looks down on a scroll laid open in a desert stream. She wears a moon shaped crown, it and her robes are glowing. A triple strung bow lies on her lap like a harp. She kneels between two trees. The water is evaporating. There’s a starfield in the background. Character: The occult knowledge on the parchment is in no fear of being washed away or drowned; its hidden plan protects its destiny. She plays her music, the song obscured from all eyes save her discerning pair. Her robes are alight with nighttime glow; everything has a soft light about her. She prays between two trees, one representing the masculine (sharp edged), the other feminine (curved). She understands the relationship between the sexes and the magic those sexual energies represent. She is the subconscious, the goddess, magic and woman. The water that flows before her flows across the entire world and she can look into the stream and scrye anything. She doesn't shoot her bow, but rather strums it like a harp; she is the hunter of hearts and emotions. The arrow beside her isn't forgotten, but it no longer needs to be used. 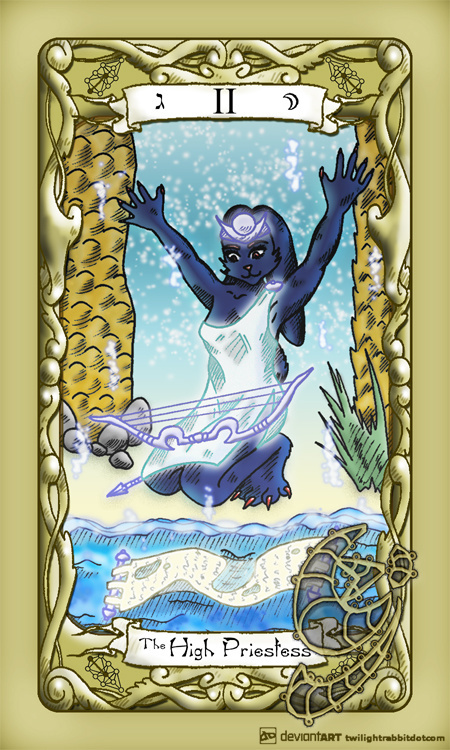 This is in contrast to the bow and arrow in Major Arcana XIX: The Sun where rabbit is about to shoot down the day star. She is Artemis/Diana/Maria, a goddess of the moon, celestial mercy visiting the earth at the shore where the physical and the supernatural meet. Meaning: In readings this card indicates time to reflect on the inner self and find the hidden meanings of life that, at other times, escape people. One should seek out advice from a person who has this insight. It is a time to look at emotions in a rational way. Notes: Originally this card was called the Popess or the Female Pope. It was so controversial a concept that it was temporarily replaced for a time (at the behest of the Christian Church) as well as the subjects of the Empress, the Emperor and the Hierophant (then known as the Pope) and replaced with four other cards known as The Moors. The secret of the Popess was her being a female (sometimes pregnant) pope, and the card is associated with hidden knowledge and secrets.